Minto (2011 pop. 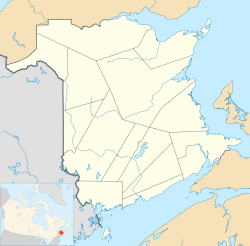 2,505) is a Canadian village straddling the border of Sunbury County and Queens County, New Brunswick. Located on the north shore of Grand Lake, approximately 50 kilometres northeast of Fredericton, its population meets the requirements for "town" status under the Municipalities Act of the Province of New Brunswick, however the community has not made any change in municipal status. Location of Minto within New Brunswick. "Just how the name of Minto came to be adopted is said to have occurred in this way. A letter which was sent from Moncton to Mr. Kennedy was enclosed in an envelope which bore the name of the Minto hotel, Moncton. The family thought Minto a good name for their hotel, and so it was named. Then the people generally adopted the name for the place, and so the railway people designated it." Minto did not feel the depression, or at least did not feel it in the same way as most other places in Canada; during recession and the Great Depression, Minto was profiting from a coal mining boom. The coal brought a level of financial prosperity to the community in the early 1900s, which by the late 1930s turned into a profitable venture for companies, and brought starvation and disease to a then impoverished community. As stated in the United Mine Workers' Journal of 1937, "Nowhere on the American continent, is there a strife which combines the elements of greed, harshness, cold, suffering, and want, as exists [in Minto]." Early in Minto's coal mining exploits, land owners were permitted to mine under their own land without obtaining a license from the Crown or paying any royalties, which ended in 1915. During the boom, both mining conditions and the living quarters of miners' families degraded with lowering wages and lack of maintenance in the mines and homes supplied to the miners families. Although a tally of the number of deaths related to the coal mining industry in Minto is not available, deaths did occur. The memorial stone of five who died in an abandoned mine shaft in 1932, Minto, New Brunswick, Canada. The inscription (1982) on the Minto Memorial Stone. The need of transporting coal brought the railway to Minto, and was to make the area "the most prosperous place in Canada." The New Brunswick Central Railway ended at Chipman (about 15 miles (24 km) north-east of Minto) and in 1901 the railway was planned to be completed by constructing through the village to Fredericton, and connect with the Canadian Pacific railway. By 1904 the railway was completed as far as Minto, merging with the existing Central, however by 1905 completion to Fredericton was abandoned and the remaining railway was not built until 1913. The Grand Lake Generating Station near Minto, New Brunswick, as seen in May 2010. During the early years of the Great Depression, the New Brunswick Power Corporation built the province's first thermal generating station south of the village on the shores of Grand Lake. Opened in 1931, the Grand Lake Generating Station accessed coal from nearby deposits. An NB Power subsidiary, NB Coal, was the only mining company left in the Minto area and performed strip mining. NB Power closed the Grand Lake Station when its operating license expired in June 2010. As the Station has been NB Coal’s only customer since 2000, NB Coal closed in December 2009. On April 19, 2012 the Grand Lake Generating Station was demolished, and by this time all coal mining in Minto had ended. During the Second World War, the largest internment camp in eastern Canada was located in the hamlet of Ripples, 10 km west of the village of Minto. Originally it was home to German and Austrian Jews who had fled the Nazis to England. Some youths later became notable, including theologian Gregory Baum, chemist Ernest Eliel and physicist Walter Kohn. Later after these Jewish refugees had been released into Canadian life, it became a camp mostly for German prisoners of war, as well as some sympathizers such as Canadian fascist Adrien Arcand. Its most notable prisoner at this time was the anti-conscriptionist mayor of Montreal, Camillien Houde. This internment camp is now a protected site visited by tourists. The only structure remaining at the site is the base of a water-tower where a plaque stands, visible from the highway. A walking trail leads into the forest where a few ruins of the camp and posted signs describing the area may be found. There is a small museum dedicated to the camp located within Minto's municipal building. Though Minto is a very small community, there are recreational activities that take place year-round. It has the Minto Centennial Arena, lighted and unlighted ball parks, two family parks, nature trails, mountain bike trails, and hunting and fishing resources. Each year there are two festivals in Minto. In summer the Minto Fun Days (also known as the Minto Coal Mining Festival) is celebrated in June–July, first run in 1972. The Santa Claus Parade and Tree Lighting Ceremony is celebrated in November–December, with the first annual parade held in 2010. Once a year mountain bike racers descend on the town of Minto for a race known as 'The Coal Miner's Lung'. The endurance race covers 20km, 40km or 60km of Minto single track. Minto Gazebo in Veterans Park summer 2013 in Minto, New Brunswick. There are two schools in Minto: Minto Elementary and Middle School, and Minto Memorial High School. Both schools offer extracuricular activities including sports clubs, destination conservation, peer helpers and student government. While Minto Elementary and Middle School is a newer building, Minto High has been added to with a new gym and shop. In 2011 the New Brunswick Community College (NBCC) Fredericton campus established a satellite campus the Minto Regional Delivery Site. ^ Statistics Canada "Community Profiles: Minto, New Brunswick (Village)", March 30, 2011, accessed August 4, 2011. ^ "Newcastle Creek: The Great Coal Mining Centre of New Brunswick. ", St. John Daily Sun, October 29, 1902, accessed August 5, 2011. ^ "Newcastle Coal Fields. ", St. John Daily Sun, September 7, 1903, accessed August 5, 2011. ^ Seager, Allen "Minto, New Brunswick: A Study in Canadian Class Relations Between the Wars", Labour / Le Travail, Volume 5, Spring 1980, accessed August 5, 2011. ^ Seager, Allen "Minto, New Brunswick: A Study in Canadian Class Relations Between the Wars", Labour / Le Travail, Volume 5, Spring 1980, p.86, accessed August 5, 2011. ^ "Killed on Central Railway. ", St. John Daily Sun, March 15, 1905 p.9, accessed August 5, 2011. ^ "Mine Gas Kills Five", St. Joseph News-Press, July 29, 1932 p.12, accessed August 5, 2011. ^ "A Dangerous Piece of Legislation. ", St. John Daily Sun N.B., April 14, 1905 p.6, accessed August 5, 2011. ^ "NB Power pulls plug on Grand Lake station". CBC.ca. September 29, 2009. Retrieved October 25, 2009. ^ "Grand Lake Generating Station - Demolition of the Smoke Stack", Geotechnical Technician exp Services Inc., April 19, 2012, accessed January 22, 2014. ^ a b c "Remnants of Second World War internment camp remain in rural N.B. ", CTV News Atlantic, October 30, 2013, accessed April 15, 2014. ^ "New Brunswick Internment Camp Museum", accessed April 15, 2014. ^ "Minto, New Brunswick". Canadian Climate Normals 1961–1990. Environment Canada. Retrieved March 24, 2015. ^ "Federal and Provincial Governments Invest Stimulus Funds in Upgrades for Minto's Centennial Arena", Atlantic Canada Opportunities Agency, August 12, 2009. Retrieved December 10, 2011. Michael Allen is a 20-year-old $100,000 winner of the Atlantic Lottery 649 as of October 21, 2011. ^ "Minto Centennial Arena Ice Skating Rink", Rinktime.com, accessed December 10, 2011. ^ a b "Minto Coal Mining Festival" Archived 2012-04-05 at the Wayback Machine, Village of Minto, accessed December 10, 2011. ^ "Come Celebrate With Us!" Archived 2011-08-27 at the Wayback Machine, 2011 Festival Schedule. Retrieved December 11, 2011. ^ "Village of Minto Minutes" Archived 2011-08-27 at the Wayback Machine, November 9, 2010. Retrieved December 10, 2011. ^ "Mountain Bike Minto". Mountain Bike Minto. Retrieved 2018-06-28. ^ "Coal Miner's Lung MTB Race". River Valley Cycling. 2016-06-02. Retrieved 2018-06-28. ^ "From 'mud dumps' to top-notch trails: How the Minto coal mines were transformed | CBC News". CBC. Retrieved 2018-06-28. ^ "The Daily Gleaner". www.telegraphjournal.com. Retrieved 2018-06-28. ^ "Coal Miner's Lung celebrates Minto's move from mines to mountain bikes - Canadian Cycling Magazine". Canadian Cycling Magazine. 2018-06-23. Retrieved 2018-06-28. ^ "NBCC expanding to Minto (10/03/11)", March 11, 2010. Retrieved January 22, 2014. ^ "NBCC Annual Report 2010-2011", March 11, 2010 p.10. Retrieved January 22, 2014.